The Beach Front Getaway house is located in the South Campos of San Felipe at KM 31.5 approximately 20 miles south of the town of San Felipe in an enclave of custom beach front homes. Only a 2-1/2 hour drive south from the California border at Calexico/Mexicali. Description: Solar powered Off Grid ECO beach front living at its best with Wi-Fi. The house has a great sandy beach right in front. Perfect for hanging out, swimming and just relaxing. Many of our guest love to paddle board, kayak and shore fish. Great views everywhere you look; from the amazing sunrise over the Sea of Cortez to the sunsets over the Desert Mountains to the star gazing at night. We fell in love with this beach spot over 30 years ago and now have this great house to share with guests.. If you are looking for an incredible visit to Baja, the real Baja where the sea of Cortez meets the desert this is the place. You will feel like you are a million miles from home and it’s only a 2-1/2 hour drive from the border. The property has a Baja beach house vibe with all the comforts of home. It features approximately 1200 square feet of comfortable living space with 2 bedrooms 2 baths each with queen beds and a garage for your vehicle. A covered beach front veranda surrounds the front of the house. This is a perfect place to hang out and relax. Plus there is also about 1000 square feet of outdoor patio space so you can easily sit in the sun or in the shade and have a nice dinner outside. We have been HomeAway.com vacation rental owners for many years with consistent 5 Star reviews on all of our properties and are a recognized HomeAway "Premiere Partner". Rent with confidence and see our other reviews on the other Baja Beach house in the same enclave. We love beaches and traveling. We have been vacation rentals owners for a few years and just decided to share our favorite beach with guests. Our other properties are in Newport Beach CA HomeAway property id # 296084 & 941717 please see our reviews! We also have a second Baja beach front home in the same enclave. "Baja Beach Front Villa" property Id # 435527. 3 bedroom 2 bath and accommodates up to 7 guests. Rent both houses. Great way to have multiple families all at the beach! 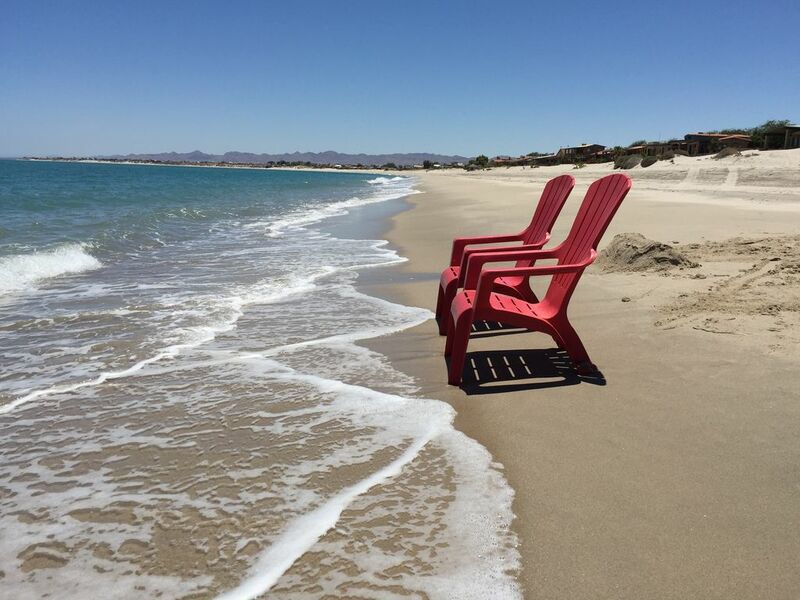 We have been traveling to Baja for 30 years and fell in love with this beach location. It's an amazing place. We get to spend some great family time when we go there and completely unplug. It is one of my favorites spots in the world. The review below says it all, as to why this is such a magical place. "Our family has been going down to this part of Baja for over 20 years. Our friends stayed in the other home in the neighborhood, so we had a fun group. There is something very special about watching the sunrise over the Sea of Cortez - every morning is magical! We had perfect weather with amazing beach days. Lots of kayaking, SUPing , Beach walks and relaxing. The highlight of the trip was watching baby sea turtles hatch from their nest and make their journey to the sea. This happened on four consecutive mornings about a third of a mile north from the house - we had never seen this, so a bucket list item for sure! The entire week was magical! Can’t wait to go back! Thanks so much Joe!!!" Very Private in an enclave of customer beach front homes. Beach Front Getaway with wonderful sunrise and sunset views. Right on the best beach in San Felipe. Off grid ECO friendly solar powered home with Wi-Fi. The house is large, architecturally interesting, on a gorgeous miles long white sand beach. Beds were very comfortable, plenty of towels, pretty well equipped with everything. Caretakers were very quick to help us out. Minor things: the oven didn’t work,, it’s Mexico, sometimes that’s just the way it is. Would highly recommend for a large group, who wants peace and quiet. Photos are very accurate of the house. Kitchen had everything we needed. Excellent views out the front and the back of the property. Very peaceful location. Ready check in and ready checkout. Being right on the beach, the house was very pleasant - perfect for us! As an architect I particularly liked the way the kitchen and main space has an extended expanse of glass across the beach side of the house, but was nicely shaded by the porch on the beach (east) side and to the south. The large circular walk-in showers were also very enjoyable. The directions were clear and the arrangements with the caretaker all went smoothly. We will consider this house for our next trip to the beach. We had the stove and oven checked and it's all working. Guest must have accidentally turned off power to the stove. The switch is on the kitchen island next to the stove and the stove needs power for the electronic igniter. Typical temps in October: low range from 69-76 and high range 83-89 hence guests have not needed a heating system. Heating system installed for colder months December/January. Absolutely loved it here. The house is beautiful, comfortable, clean and had everything we needed. Great view of the ocean and beach. One thing we can’t stress more about was the people we were surrounded with and how friendly everyone was. Can’t thank you enough for everything!! Very nice, off the grid home. Enjoyed all aspects of the home, family felt very safe, very quite. I only have one critique there was a 3 ft drop from the deck to the beach that was very difficult for my family to navigate, maybe some stairs would ease that. Other then that I would come again and again. Thank you for the 5 star review. Glad to hear that you enjoyed the house. I have asked the caretakers to take care of the sand area off the ocean front patio. The wind must of moved some of the sand. Looking forward to your next visit. Cleaning fee of 150 is paid directly to local caretakers at check in.